The principle is quite simple, there is a strong electric current in a thin resistive wire. The wire under the effect of current, heat and cut easily and cleanly styrofoam, much much better than with a knife or a cutter, particularly for large pieces (> 5 cm thick). 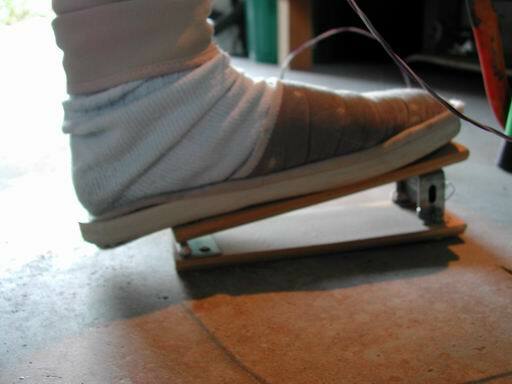 It can also be use to cut plastic or synthetic foam. Build a filicutter is only adding a current source to resistive electrical wire, adding a control switch and possibly a light bulb to limit a bit the current passing through the wires. This way you control switching on/off heater wire with a finger, and guide cutting with the same hand. When you've read the principle, you can do it in your way. Here is mine, made with resistive wire and car battery charger. 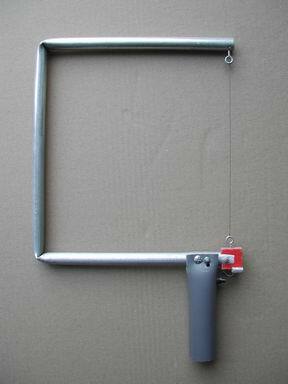 Fold metalic pipe to make the "U" according to your dimensions. Cut the handle in plastic pipe. On top of this pipe, make (using a saw) a place for the "U". Make a hole for your push-button, in the right place for your finger as a trigger. Connect two wires to push-button, and put them inside the handle. Put the "U" in the handle, let 2 cm - 1 inch exceed, and fix it by making two holes througt the handle. Put two bolts in those holes, and put two nuts on the other side. You should have in your hand something light, with push-boutton right under your index. Add then the resistive wire on the "U". 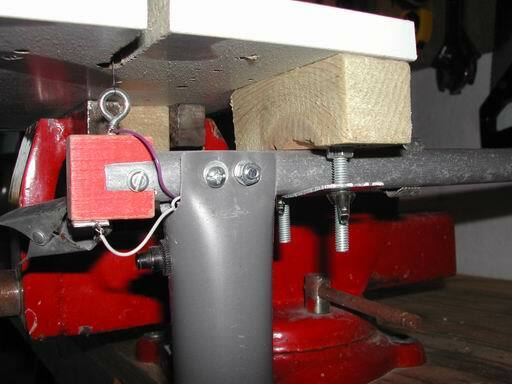 On top, use a small metallic bolt with a ring head. You shoud use metallic bolt because and electric contact is needed on that side. 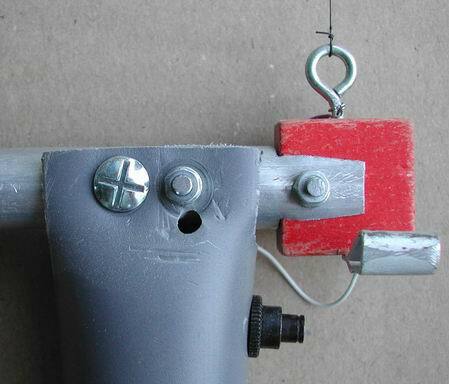 On bottom, contrarily wire should be insulate from the "U": use a small piece of wood, fixed with another bolt and nut, then another metallic bolt with a ring head. One arrival of power to the "U" (using an alligator clip for example). Alain told me that you should be careful with styrofoam smokes when cutting, they are toxic and should not be breath. 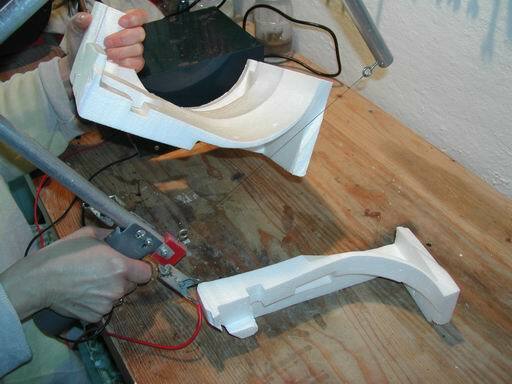 Filicutter with handle like this one is very useful for... sculpturing styrofoam, but it's a bit difficult to make straight cuts. If you have this kind of cuts to do, it could be interesting to improve it by making a kind of stand. 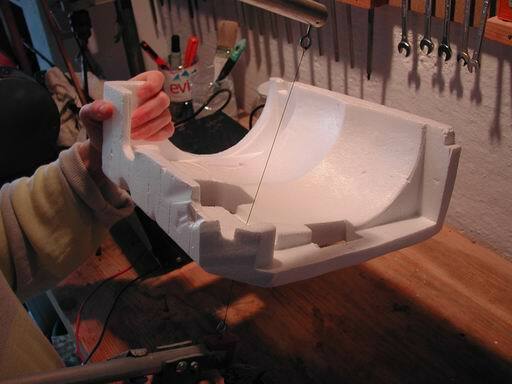 The idea is to make this stand with a right-angle system and another push-button commanded by your feet, so that your two hands are free to control the styrofoam piece move. 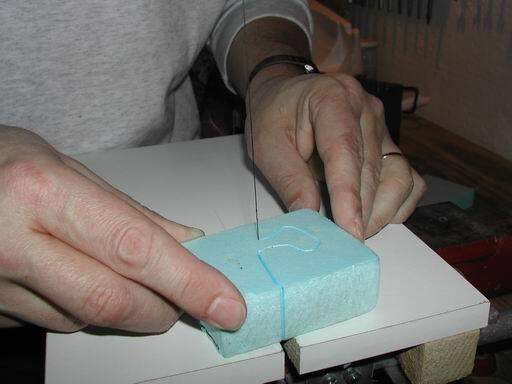 To do that, you should make a small table, with a hole in and where the wire pass through. 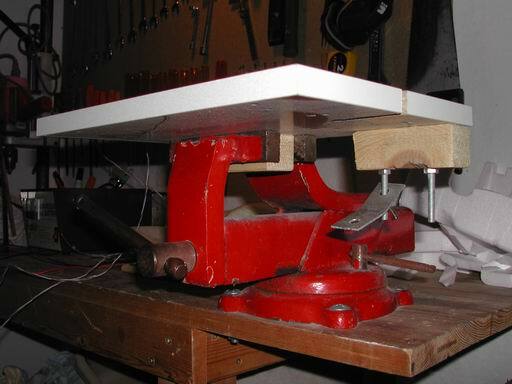 Table and filicutter should be in right angle, stable and connected, for example in a clamp. Using a lamp to enlighten the place where wire cut (more comfortable). 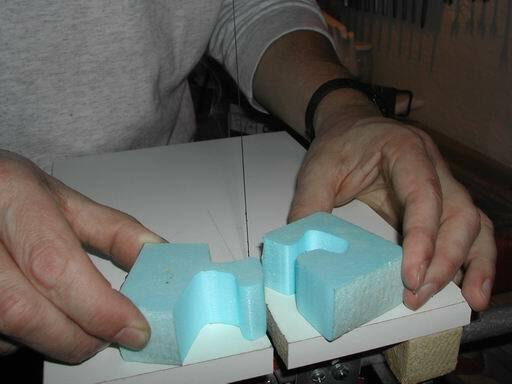 Adding a guide for cutting on a side, to be sure to have straight cutted pieces. 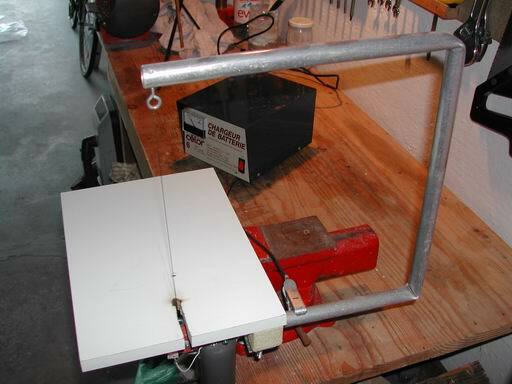 Adding a regulation sytem for bending wire, no matter it is cold or hot. Of course, if you want to give or ask precisions or informations, don't hesitate to contact me. I want to make a hot wire cutter to cut round grooves [1/2"; 3/4"; 1"; etc. in the styrofoam portion of ICF [insulated concrete blocks] after installation for plumbing and electrical channels. How can I make a cutting edge in a U shape for this purpose? 26 gage nichrom wire is too flexable for the U. Maybe you can use the heating wires inside a reformed old hair-dryer? Will guitar string work?? Have tons of that. I don't know, probably yes, but it should be tried. Good job on your wen page! Is the battery 6 Volt or 9 Volt? it's a car battery, 12 volts. No, too high in volts and so too dangerous. I have sheets of strofoam which is 30" X 20", and is 6 cms wide. What I need to do is to slice the sheet into 1 cm widths. Will I be able to do this, using your method? Yes, but you need a cutting wire of at least 20 cm long. Yes, make tests to find the right one. Can i use adapters so that i can reduce the volts if i'll plug it in a house electric outlet? Thank you for this great tutorial. What is the thickness of the resistive wire that you used? Thanks. Already indicated, but it's 0.4 mm. Anyway no need to be precise, any wire will be ok.
we are trying to construct a hot wire cutter to split 4 inch thick foam board into 2 inch thick. It needs to have an approximate 4 ft. cutting wire area. Will we need to increase voltage or will a commercial battery charger work for this length cutting wire? 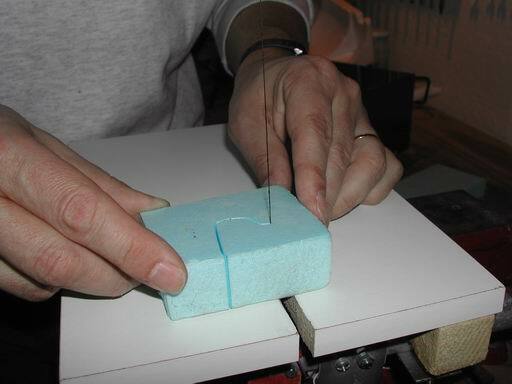 But you'll certainly need to push the piece of foam a bit slower, to get a nice cut. 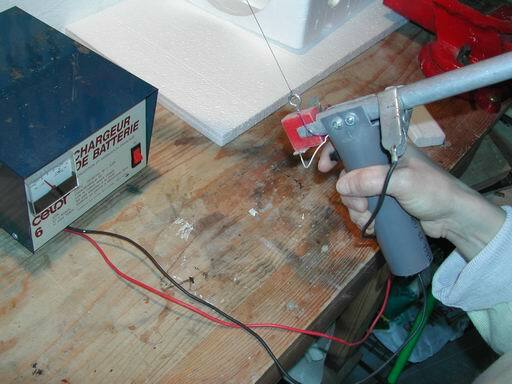 You can use the tungsten wire out of an electric bar fire with a 6v (square) battery for a more portable unit. It's just for science project. I'm afraid it's a bit low. No idea what it is, anybody else? Would 18 volts be adequate? It depend on your wire size, but should be. It depend of the size (diameter) of your wire, could be tried. 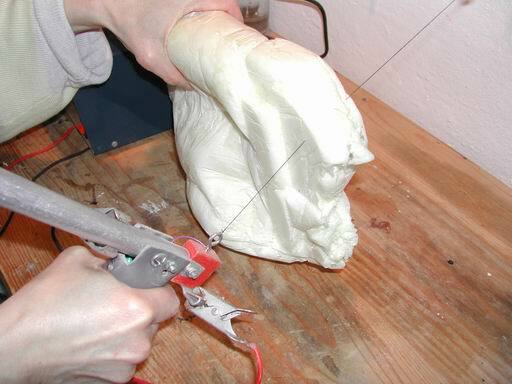 What is optimal temperature for cutting styrofoam and how to make ( for instance) 100W cutter if I have transformer of 17,5V? I don't know, but it's a rather slow temperature, I mean the wire don't need to become red. I like the page. I am desperately trying to make a hotwire cutter but getting kind of confused. Ive spent about a hundred dollars and gotten nowhere with what I thought was good information that I dug up on the internet. I like the idea of using a car battery. 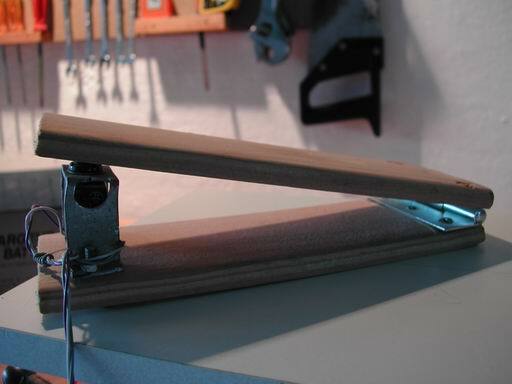 I need to be able to cut styrofoam about 4 feet in length.Is it possible with this kind of setup? What kind of wire will I need to hook up battery and what kind of wire for the cutting? Id appreciate your comment. Thank you. Yes it is, and everything about the cutting wire is in the text page. 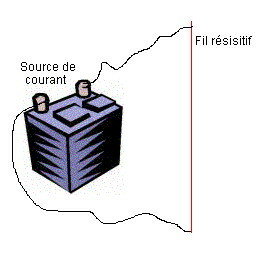 For the battery wire use standard cooper wire of appropriate diameter (not too small). Great tutorial, I've been entertaining making one of these or something similar to try and cut a memory foam pillow. With it being so dense do you think this method would work? Yes, I think so. I got friends who cut foam mattress for their baby bed with it.